A Post Office in Shanghai. Photo by SimonQ, Creative Commons. Attached to the announcement is a list of people and publishing houses, containing many familiar names: Liu Xiaobo; Zen Jinyan, wife of AIDS activist Hu Jia; intellectuals Xu Youyu and Chen Ziming; exiled writers Liao Yiwu, poet Bei Ling, Yang Jianli, and Yu Jie; even Jasper Becker is on the list. Be aware that this is not just a list of banned books but also banned authors and publishing houses located in Hong Kong, and Taiwan, as well as one in the US and one in Germany. Although we cannot verify the authenticity of this notice, we can look at past experience and see that recipients in China seldom receive the books their friends send from overseas. 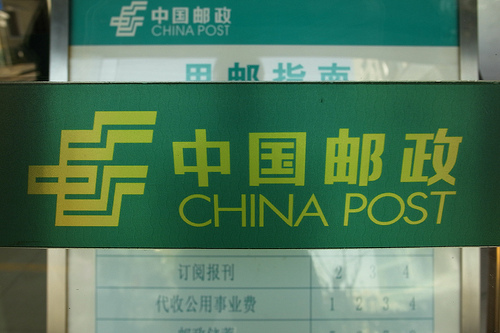 It is an open secret that such mailing lists of banned books exist and that the Chinese authority controls the postal system and treats it as an abettor to reinforce censorship. But China’s censorship can’t be enforced beyond its border, not even in Hong Kong; thus, prohibiting disturbing books from entering China is logical. Mainlanders have also changed their shopping habits over the last few years. Initially only a few privileged Mainlanders came to the former British Colony to buy luxury items. Now they are more interested in books and publications that are banned in China. They smuggle books across the border where they are quickly reproduced and sold on the black market. Books about the private life of high politicians are the most popular. How many villas, Rolls Royces, concubines, and mistresses do the high cadres have? The eager readers do not care whether the sources are reliable. The voyeurism present in a closed society, where rumors prevail over information, finds an outlet in these books. Common people’s curiosity combined with jealousy and hatred is a funny mixture. It scares the government, which fears the invisible power of words and information. Maybe the banned mailing list is meant to ease their anxiety. What will happen to the banned books if they fall into the hands of the post and customs officers? Will they land in the trash or will they be handed over to the police like drugs? I can only guess. I’d rather believe that the confiscated books will land on the bookshelves of government servants, where they will be hastily read and handed off to the next eager reader.